Rodents are a destructive and potentially dangerous uninvited house guest that no one wants to find in their home. Rodents are mostly scavengers and will mostly come into contract with humans while they are searching for food, either in a home or scavenging through yards and gardens. Rodents are not only a nuisance because of the damage they can cause to packaging, furniture as well as damage that can be caused to lawns with travel patterns, but also can be dangerous because of the diseases they carry. Rodents can spread diseases to people through their bite, contaminating food while scavenging, as well as pass on germs that are left behind from urine and droppings. Rodents are also known to spread diseases by being a carrier of ticks, mites, and fleas. Guarding against rodents can be very important to families, especially those with small children. The easiest way to guard against rodents is by reducing the accessibility of food. For example, garbage and pet food should be kept in rodent proof containers. Also cracks in walls and open pipes should be sealed tightly to prevent rodents from gaining entry into the house. If rodents have invaded your home, don’t waste your time and money trying to deal with these pests by yourself. Instead, allow Senske Pest Control to apply their years of expertise and nationally recognized technicians to handle rodents for you. Contact us today at (877) 944-4007or request an estimate online for FREE, and protect your home from rodents for good. There’s nothing that disrupts your household like finding rats in your attic or mice droppings in your pantry. Rats and mice can pose health and safety issues to your children, your pets, and your property. Their feces, urine, and hair can contaminate large areas and can carry diseases, their nesting and gnawing can cause major property damage, and their wire chewing can create an unsafe living environment by causing electric short circuits and fire hazards. Call Senske at (877) 944-4007 or request a free estimate. With the rodent population on the rise, it’s important to know what to do when you see a rodent in your house. Take action at the first sighting of a rat or a mouse- don’t let it become an infestation. Rats and mice can carry many diseases and can compromise the health and safety of your loved ones. Senske Pest Control has been controlling and treating rodents since 1947. Our methods for rodent removal are approved by state and the federal government. We are licensed as a pest control company under the Department of Agriculture. Senske’s trained technicians will safely and responsibly remove rodents from your house, making sure your family is pest-free. The Senske Promise protects you and guarantees that you will be 100% satisfied with our rodent removal service. Let Senske Pest Control Services protect your family and your home from the hassle that rodents can create. We will get rid of all rats and prevent them from returning. Contact us at or request a free estimate. We know that finding a rodent in your house or place of business can be unsettling, therefore we take every contact to Senske Pest Control seriously. We will first set up an initial assessment at your location. During this assessment, we will determine the severity of the rodent invasion and provide you with an estimate for the suggested treatment plan. After our service is complete and we eliminate all rodents from your household, we urge you to take action to prevent rodents from coming back. Because pest control is becoming a huge problem, we encourage you to sign up for our bi-monthly preventive and pest control program. With this annual service, we guarantee you will be rodent-free AND pest-free. Our bi-monthly program leaves your family safe from any critter or rodent invasion through the use of preventive pest control and continuous pest maintenance. It’s important to address a rodent sighting in your house right away. A single mouse can lead to an infestation of many mice very quickly. Although DIY (do it yourself) rodent removal can be effective, rats and mice are more successfully removed when using a professional pest control service- a trained exterminator who knows the behavior of rodents and can easily and quickly track their paths and find their hiding places. 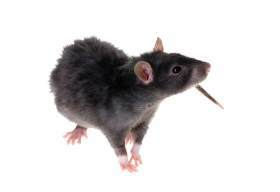 Rats and mice can live in walls, attics, or anywhere a building has a small opening. Mice can crawl through a hole that is only one-fourth of an inch wide. Many times if a rat or a mouse cannot find a hole that is big enough to crawl through, they will create one by chewing through the walls or ceilings of your house. Contact Senske Pest Control today at (877) 944-4007 to remove any unwanted furry creatures that are invading your house or commercial building, or request a free estimate. Rats and mice come in many different shapes and sizes. All rats and mice are nocturnal- which explains why they can occupy space in your house, yet remain hidden from you for so long. Chances are, you won’t actually even spot the mouse or rat living in your house, you’ll just see their droppings and witness the destruction they have caused. It’s important to contact a pest control company immediately if you think you have mice or rats living in your household. They are common carriers of many diseases: plague, typhus, salmonella (food poisoning), leptospirosis, rat bite fever, Hantavirus and Rickettsia Pox (transferred through rat and mouse feces), Shigella, Campylobacter bacteria, tapeworm, infectious jaundice, and tularemia. Rats and mice carry fleas which can also be carriers of disease. Although rats and mice only actually eat a few grams of food a day, all food that has been touched by rodents should be disposed of to reduce the risk of disease. Unfortunately for the rat and the mouse, they are tiny creatures who have the possibility of creating massive amounts of destruction within your household and to the people who live in it. Roof rats, known as Black rats, are smaller in size than Norway rats and are usually 10 to 14 inches long. Roof rats have larger ears than Norway rats. Their tails are longer than their bodies. They prefer habitats with lots of vegetation and standing water. Their diet consists of seeds, nuts, fruits, and vegetables, but they will scavenge almost any kind of food if their preferred food source is scarce. Roof rats ​are believed ​to have arrived on imported palm trees. Although they live less than a year long they can start reproducing after two months of age. Females can have up to six liters per year and in each litter, there can be eight babies. Knowing these statistics make it easy to understand why the Roof rat population is thriving. Norway rats, or Brown rats, are larger and more aggressive than Roof rats. Their tails are shorter than their body and they have small ears and blunt noses. They can grow between 13 to 18 inches long. 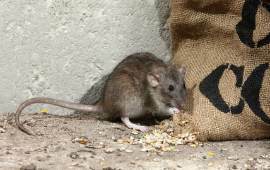 Norway rats are scavengers and they prefer to live in unsanitary places, such as garbage. They are more likely to infest structures than Roof rats. Like Roof rats, Norway rats generally live less than a year but can produce 48 babies during that time period. Rat control is becoming increasingly pertinent. It’s important to find a pest control company that is dependable and reliable to help keep your family healthy and your property safe. Contact us at (877) 944-4007 or request a free estimate today. Native Desert Wood rats are native to Southern Nevada and found in rural areas. Scientists have done multiple tests on Native Desert Woodrats in and around the Western US and have found that some do test positive for the plague and Hantavirus. With the population of humans and housing construction increasing in western states, Native Desert Woodrats have been forced into urban areas. Native Desert Wood rat sightings are more common than ever and need to be taken seriously. If you think you have a Native Desert Wood rat in your house, don’t try to remove it. It’s best to have a professional rodent control technician handle the rat in case of a disease. Field mice, known also as Deer mice, can live up to 20 months (but usually get eaten by predators within three months). They are usually colored orange or brown with a white belly and a yellow stripe on their chest. They are very small and range between 80 to 100 millimeters long. 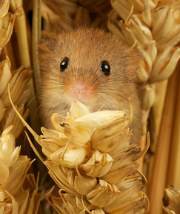 Field mice create nests in the ground by burrowing holes. They eat field crops and can cause major destruction to rural areas and agriculture. Generally, they will only be seen inside of barns or sheds during winter to find food. House mice range in color from brown to black, to white. They prefer to live in crevices on the ground but can also climb. They are small and can fit in cracks only one-fourth of an inch wide. Their preferred food choice is dry cereal. 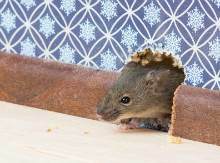 Checking your pantry could be a good indication of whether you have a House mouse. House mice are active in all parts of the year, which means you could find them invading your household during any season. Because House mice are very curious, they can cause massive amounts of destruction to your house or property. They are known for chewing through clothing, wood, wires and housing infrastructure. House mice can start breeding after only 8 weeks and can have litters of more than 15 mice, almost 10 times a year! If you spot a House mouse living in your kitchen act quickly before things get out of hand! Contact Senske Pest Control Services at (877) 944-4007 or request a free estimate.